Hello again to all the racers out there! I'm sure you've been wondering where I've been. Truth is, it's been a very busy winter working on our racecar, getting it ready for the season. But I've been anxious to talk with you again! With the new season right around the corner, I decided it was time to wipe away some of the cobwebs which may have formed in my mind and review some of the basic knowledge for setting up a dirt racecar. But instead of gaining clarity I became confused, and I am once again in desperate need of your help! It all started when I read an article by Sleepy Gomez, "Getting a Handle on Handling," in the February 2002 issue of Stock Car Racing Magazine. I invite you to dig out and reread your copy of the article. Then read my review and see if you can help straighten me out! "Getting a Handle on Handling"
In his February 2002 Stock Car Racing Magazine article, "Getting a Handle on Handling", Sleepy Gomez tackles two circumstances which a driver might face while racing - a tight condition and a loose condition. A tight condition is caused by the front end not having enough traction to overcome the straight-line inertia of the car, causing it to skid up the track rather than turn the corner in the arc intended. Easy enough to follow so far. But here comes the problem. To correct this situation when entering the corner, Sleepy states that, assuming the rest of the suspension is somewhat close to correct, more weight must be added to the right front. Why? Because, he continues, more weight on the right front will create more traction for the front end. It would seem that Sleepy believes the reason the front end did not have enough traction was due to lack of grip on the right front. How can one add this weight? Simple. Jack weight into the right front via the weight jack. So, why is this a problem, you ask? Well, it is causing some confusion for me based on what I've read elsewhere on the subject. Sleepy's solution appears to be a contradiction to what is found in Steve Smith's book, Street Stock Chassis Technology, on pages 144 and 145. In addressing the condition of a car being loose on turn entry, Steve recommends adding more cross weight. "Cross weight tightens up the chassis." Why? On page 21 of the same book, he states, "More loading on the right front and left rear keeps the rear end of the car tucked in, preventing oversteer. The more cross weight, the more the rear end is tucked in because the right front tire slip angle is increased over the right rear tire slip angle... If the car is pushing, less cross weight is required." Translated into layman's terms, adding weight to the right front will tighten the car going into the corner. Smith seems to focus on the rear end to solve the problem with corner entry while Sleepy looks more towards the front. So here is my question - Who is right? Are they both correct and I'm just misreading them or are they truly contradicting each other? And if they are not contradicting each other, how can one harmonize these two views? Bottom line - If my driver complains about being too tight going in, do I jack cross weight in or do I take cross weight out of the chassis? And why? I would encourage you all to find a copy of Sleepy Gomez's article and Steve Smith's book and see what you think. 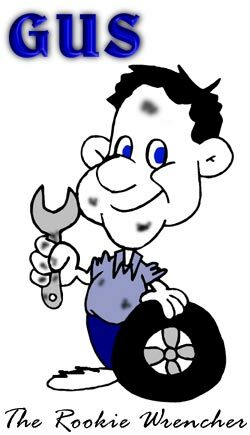 Or better yet, pull back on your years of experience and help out this rookie wrencher! Click Here to discuss Gus, The Rookie Wrencher's questions. dirtdrivers.com is always looking for energetic people to write articles about local racing. Email us if you would like to join our team.